When Joe Louis took only 124 seconds to knock out Max Schmeling in 1938, it was one of the most historic sports triumphs of the 20th century. Schmeling, a reluctant representative of Nazi Germany, had defeated Louis two years earlier, and the Reich’s propagandists had proclaimed that result — Louis’s first professional loss — as a demonstration of Aryan supremacy. The rematch was broadcast in dozens of languages. In dispatching Schmeling, Louis became a hero to a world that trembled before the ascendant Nazi war machine, and the first black man to achieve broad acceptance as a symbolic ambassador for the United States. Leon Major, artistic director of the Maryland Opera Studio, was five years old when his father turned on the radio to hear that fight. It was over in less time than it took Major’s dad, a tailor in the shtetl, to get a glass of tea from the kitchen. Now 77, Major isn’t quite sure whether he remembers the match firsthand, or if he heard about it later. Memory is funny that way, especially when we’re very young. But Major vividly recalls Louis’s career-ending loss to Rocky Marciano in 1951. “That incident stayed with me, because it was so devastating to so many people,” Major says. Even Marciano had looked up to Louis — he visited the fallen champ backstage after the fight to apologize for beating him. Four decades would pass before Major began thinking seriously about making Louis’s life the subject of an opera, but once the notion seized him, it wouldn’t let go, even after numerous composers and a librettists turned the commission down. Some even suggested an opera about Jackie Robinson instead. Major’s underdog dream has at last materialized: Last weekend, Shadowboxer, an original opera by composer Frank Proto and librettist John Chenault, directed by Major, had its premiere at the University of Maryland’s Clarice Smith Performing Arts Center. As with most new operas, it’s initially set for only a handful of performances; the third of which is tonight at 7:30. After the show closes on Sunday, its future is unwritten — Major’s two prior commissions for the Maryland Opera Studio now lie dormant. But if even Shadowboxer fails to go the distance, Major and Co. have worked hard to make it memorable. Besides the orchestra in the pit, there’s a separate eight-piece jazz ensemble on stage. Cast members worked out with the University’s Terps Boxing Club (and there’s video!) 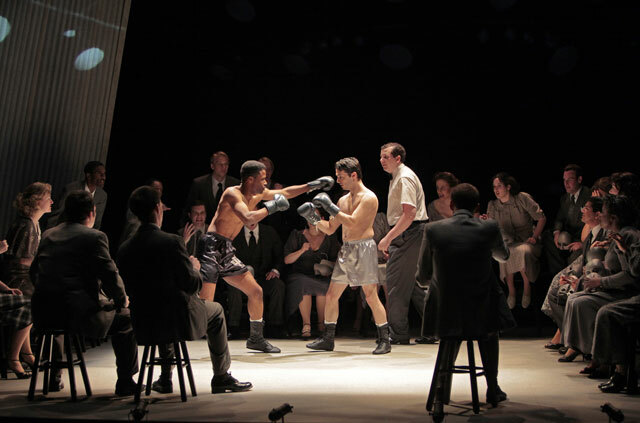 to prepare for the show, which includes stylized reenactments of four of Louis’s fights. “That was wonderful because they did suddenly realize the danger of going into a boxing ring,” says Major. Shadowboxer will be performed tonight, Friday, and Sunday. Tickets are $32 ($9 for students). For information, call 301-405-2787 or go to http://claricesmithcenter.umd.edu. This story appears in today’s Examiner. This entry was posted in Uncategorized and tagged biography, boxing, Joe Louis, opera, theater. Bookmark the permalink.